An aortic valve need not be bicuspid to calcify. Sometimes in older adults, a normal tricuspid aortic valve will undergo calcification, a so-called "senile calcific aortic stenosis." Nodules of calcification are seen on the cusps here. This diagram depicts the features of Tetralogy of Fallot:1. 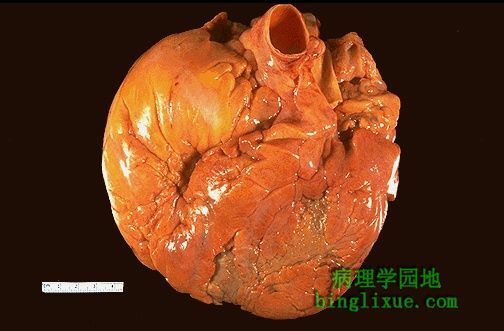 Ventricular septal defect; 2. Overriding aorta; 3. Pulmonic stenosis; 4. Right ventricular hypertrophy. The obstruction to right ventricular outflow creates a right-to-left shunt that leads to cyanosis. 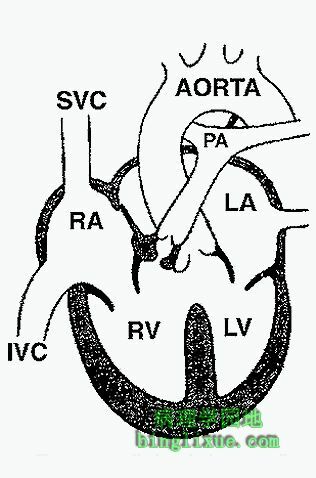 The diagram above depicts the findings with a persistent truncus arteriosus. This occurs when there is failure of fusion and descent of the spiral ridges of the truncus and conus that would ordinarily divide into aorta and pulmonic trunck respectively. 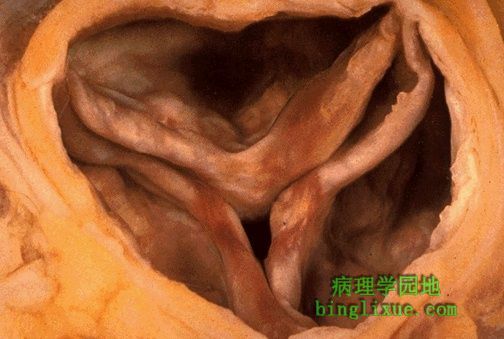 When the spiral septum fails to completely descend, the aortic and pulmonic trunks are left undivided at their outflow.The truncus overrides both ventricles.The persistent truncus is always accompanied by a membranous ventricular septal defect. 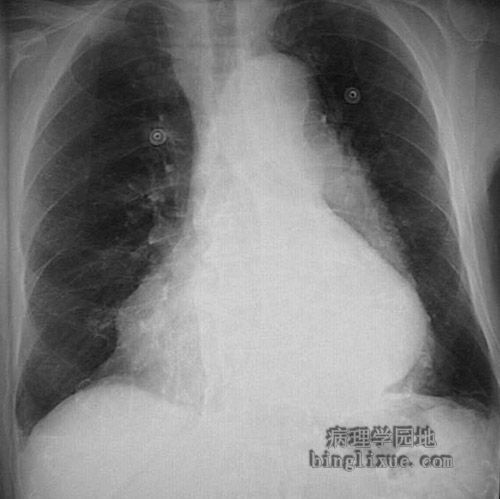 This chest radiograph demontrates marked cardiomegaly, with the left heart edge appearing far to the left. 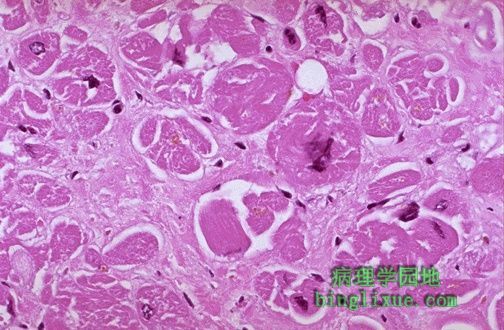 Microscopically, the heart in cardiomyopathy demonstrates hypertrophy of myocardial fibers (which also have prominent dark nuclei) along with interstitial fibrosis. 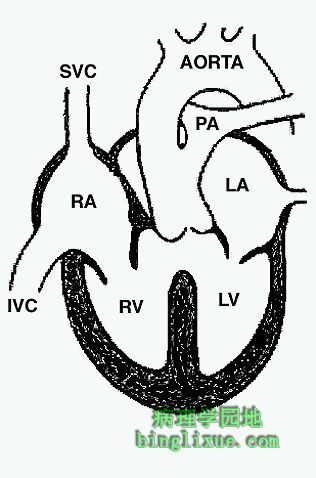 There is marked left ventricular hypertrophy, with asymmetric bulging of a very large interventricular septum into the left ventricular chamber. 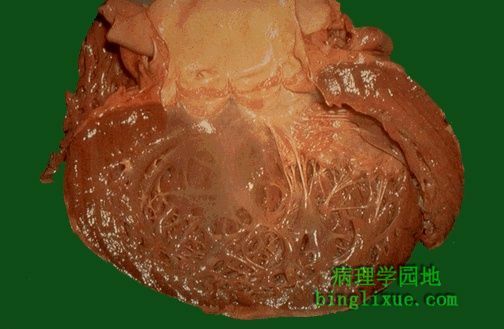 This is hypertrophic cardiomyopathy. About half of these cases are familial, though a variety of different genes may be responsible for this disease. Both children and adults can be affected, and sudden death can occur. Seen here is the explanted heart. 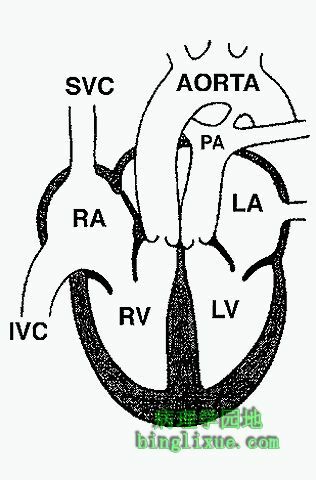 Pacemaker wires enter the right ventricle. 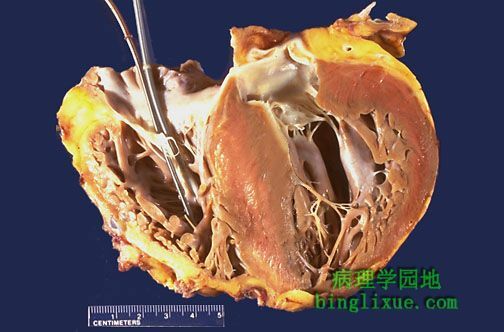 The atria with venous connections, along with great vessels, remained behind to connect to the transplanted heart (provided by someone who cared enough to make transplantation possible). 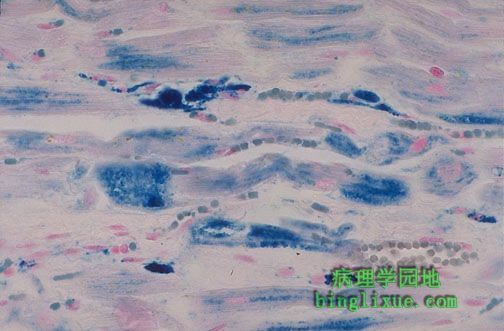 Hemochromatosis, with excessive iron deposition, can occur in the heart as shown here microscopically with Prussian blue iron stain. The excessive deposition of iron leads to heart enlargement and failure similar to a cardiomyopathy, making hemochromatosis a form of "restrictive" cardiomyopathy.